We are the market leader in the manufacturing of skylights and roof windows. 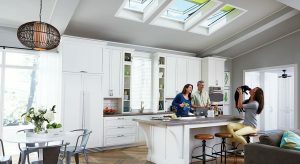 Today, as for the past 75+ years, VELUX is the world leader in roof windows and skylights. This is no accident. It is a result of our intense focus on creating the best quality, most energy efficient daylighting products available. Available to builders, architects, merchants and consumers throughout the United States, our skylights and roof windows are complemented by a complete range of blinds, electronic accessories, solar panels and shades.